My husband and I are both fans of documentaries, and one lazy weekend we discovered The Poisoner’s Handbook on Netflix. It was fantastic! The film covered the development of forensic science in New York during the 1920s/1930s. It detailed the lives of the innovators of the field, Norris and Gettler, while also providing detailed examples of the various poisons and substances studied. I LOVED IT! To date I have watched that documentary 6-7 times. And then I realized it was based on a book, so of course I had to read it! I picked up The Poisoner’s Handbook as part of Nonfiction November (I read two books for that challenge. The other was Frozen in Time) My opinion was the same for the book as the movie…it was fantastic! Blum’s writing style easy to follow, as it is informative without being insultingly simplistic. The presentation follows a relatively chronological process from the initial development of the medical examiner’s office and forensic investigation department to the establishment of national forensic standards. Yet, this information is provided strategically throughout the story. Each chapter is dedicated to an individual poison, providing stories of actual criminal cases, the process of testing for each poison, and how each substance impacted the growth of the forensic department. I turned the last page feeling as if I personally knew both Norris and Gettler. 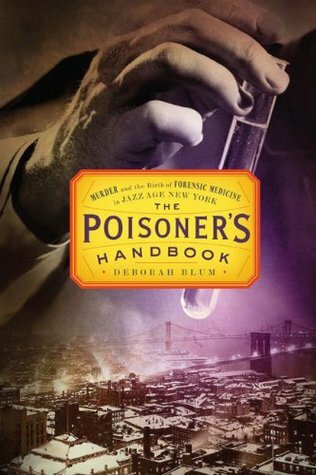 And Blum’s inclusion of actual criminal cases kept The Poisoner’s Handbook engaging, educational, and downright intriguing! I personally do not have a negative opinion to share, but I do want to note that most of the bad reviews of The Poisoner’s Handbook concern the actual science. I am an archaeologist/historian/writer by training and trade; I know absolutely nothing about chemistry. I cannot attest to the validity of the science documented in this book. I trust Blum’s presentation, but that’s all I can do at this point. I will say that these negative reviews have me wanting to read and learn more about this topic. I will recommend this book, and the documentary, to anyone remotely interested in the history of criminology and forensic investigation. I find this to be a very tumultuous and interesting time in American history, and one that I am always eager to learn more about. Let me know if you’ve ready The Poisoner’s Handbook. I want to know what you think!